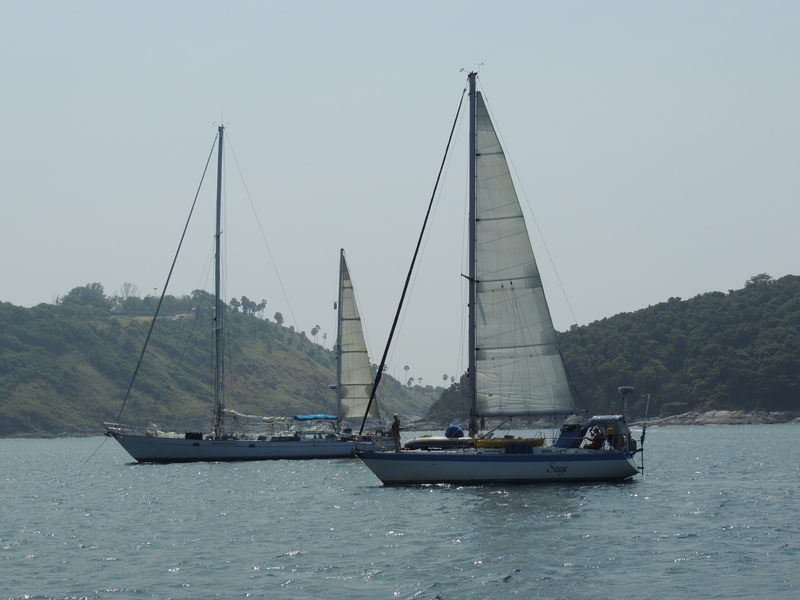 Here’s a picture of Sage sailing into Nai Harn Bay but in the background is an old acquaintance – Darwin Sound. We met Darwin Sound in !Alert Bay on our way back from Japan in 1990. We weren’t in Sage but onboard our old 8 metre boat Hejira. We took out their spinnaker pole to measure it up against Hejira and their spinnaker pole was longer than Hejira! We still aren’t in the same league as Darwin Sound’s 70 feet but we’re getting there. Unfortunately just after we dropped anchor Darwin Sound picked up their anchor and left. We haven’t seen them since. Well Connie – guess who just sailed into Sutera??? Darwin Sound. I spoke with the crew – especially Ms Za who has been onboard for 8 years, and another guy who has been onboard for 15 years. As the anchor drags eh? I still can’t believe you did it in an 8m boat the first time ’round!! Great picture – nice to see a full profile shot of Sage…she’s a beauty! I have to say the pics not mine but rather belongs to M. Reck! We won’t be here when you have your dinner in Vic. but we’re wondering what your plans are as we’ll be back in early May. Any chance of connecting with you then? Looks like a good place to leave Sage. Hi, Nice sailing. Nai Harn is one of the island’s most beautiful locations and one of the most popular places for sailing. Your adventure story is amazing.